Out of all the countries in Europe, Germany hands down has the best collection of amazing castles! From defensive Medieval wonders to fairytale castles straight out of a storybook, Germany has it all. Some of the magnificent structures were built to protect towns, while others were formed just for the pleasure of mad kings. In the past, some of these properties have helped inspire Brother’s Grimm to write timeless tales, provided the backdrop for Frankenstein’s laboratory, and even gave Walt Disney the model to create his own iconic castle. Our complete list of the best castles in Germany is sure spark to your imagination just like they have done for other travelers over the centuries! About Salzburg Castle: Towering above old town Salzburg from Mönchstein Hill, the High Salzburg Fortress (Festung Hohensalzburg) is the mightiest out of all the castles in Austria. In 1077, the Pope supporting Prince-Archbishop of Salzburg started the building the castle after tensions arose with the Holy Roman Emperor Heinrich IV (House Hohenstaufen). While the Prince-Archbishops mainly lived in the Residenz in the center of Salzburg, the fortress offered an ever-steady sense of protection for the growing city. Thanks to massive expansions in the 1500s, the High Salzburg Fortress became one of the largest castles in Europe and one of the only ones never overtaken by force. Inside Hohensalzburg you’ll find a Fortress Museum and Prince-Archbishop’s Medieval apartments which are worth a visit, but the best room is the gilded, Golden Fortress Room. The gorgeous Golden Room even serves as the setting for the daily chamber music concerts each evening. Classical music is a big theme in Salzburg as it is the birthplace of Mozart. Many of Mozart’s operas are also highlighted in the Marionette Puppet Museum located inside the High Salzburg Fortress. With views grand enough to match the High Salzburg Fortress’ massive scale, the historic castle is easily the top castle in Austria. Even if you are short on time, you’ll love the 360-degree views which let you see all over Old Town Salzburg below the castle and to the stunning Alps toward the South. Getting Here: Take the funicular lift right from the center of Salzburg up to the castle. Hours: Open all year. May-September 9am-7pm; October-April 9:30am-5pm; last admission 30 minutes before close. Website: Here. About High Werfen Castle: Not only is the High Werfen Castle (Burg Hohenwerfen) the sister property of the imposing fortress in Salzburg, but it is also one of the most stunning castles in all of Europe. The over 900-year old fortification was built in 1177 by the Prince-Archbishop of Salzburg and sits between the mountains in Werfen just 40-minute train ride South of Salzburg. Perched on a standalone hilltop along the Salzach River, the High Werfen Castle was important in the Middle Ages for defending one of the only salt trade routes that crossed the Alps all the way to Italy. The views from the High Werfen Castle of the river valley and surrounding mountains are some of the best in Austria, but there is also a lot to do here. The main activity at the castle is live Medieval falconry with two bird shows a day in the vast courtyard. As you sit in the grass you’ll see many birds of prey including hawks, bald eagles, and a black Imperial eagle zipping just past your head before they soar above the castle. There are also exhibits inside the castle highlighting both the history of the property and the history of falconry going back to ancient Asia. If you think that the High Werfen Castle looks familiar that may be because it has been featured in many Hollywood films. The films included the famous Clint Eastwood movie “Where Eagles Dare” as well as a brief cameo in the opening scenes of “The Sound of Music“. More recently the High Werfen Castle was featured in as Iron Dragon Castle (Der Eisendrache) in the “Call of Duty: Black Ops IIII” video game and served as the inspiration for Amazon Prime’s hit series “The Man In The High Castle” which it also appears in. As you visit one of the best castles in Austria in Werfen, make sure to check out the nearby attractions as well especially if you are here as a day trip from Salzburg. On one side of the river valley in Werfen, you can tour the world’s largest ice cave which you can tour on a nearby mountain peak and on the other side you can hike up to the Sound of Music Meadow. There is a wonderful trail near the castle leading up to the meadow which was featured in the picnic and Do Re Mi scenes of the movie “The Sound of Music“. With powerful towers, a huge drawbridge, and an impressive collection of Medieval armor, Kreuzenstein Castle is an amazing day trip from Vienna. There has been a hilltop fort at the site of today’s fortress since long before modern Vienna was founded. By the 1100s the fort had grown into the large Castle Grizanstein with views of the Danube River. On a clear day, views across the Danube let you see the towers of Castle Greifenstein, Klosterneuburg Monastery from 1136, as well as Leopoldsberg which was the site of a Celtic fort dating back to 400 BC. The famous Habsburg Royal Family owned Kreuzenstein Castle for 250 years prior to it being overrun in 1645 by the Swiss Army during the 30 Years War. The Polish Noble family Wilczek took control of the castle ruins in 1702 but it took 172 years for the family to start rebuilding it. The family was extremely wealthy thanks to its Silesian coal mines in Prussia. With an endless budget, Count Johann Wilczek rebuilt the fortress to serve as the family vault and renamed it Kreuzenstein Castle. In addition to his family fortune, Johann had a lot of influence as an explorer and as the Chamberlain at the court of Emperor Franz Joseph I which gave him even more resources. The Count had huge portions of Medieval buildings from other properties they family owned moved to the Castle which kept the new complex very authentic to Medieval times. The huge castle complex grew to hold a priceless library, amazing works of art, and with more than 100,000 objects. It also gained Austria’s largest private collection of weapons. A fire in 1915 and shelling during WW2 has damaged some of the artifacts over time, but much of it is still well preserved. In 2012 the castle was featured in the TV series World Without End which was the sequel to hit series Pillars of the Earth. With an amazing wall, courtyards, moat, secret tunnels, and a powerful central castle with a drawbridge, Kreuzenstein Castle sure is a treat to visit. Getting To The Castle From Vienna: From the Wien Floridsdorf Train Station it is a quick 20-28 minutes to Leobendorf-Burg Kreuzenstein Station (5€ round-trip), but then requires a 35-minute walk over to the castle which is well marked. It is only 27 minutes from Vienna by car to the castle parking lot. Visiting Hours: Daily April-October 10am-4pm; Sundays until 5pm; Closed November-March. 45 Minute guided tours at the top of every hour. Cost: Adults 10€; Kids 5€. Castle Website: (HERE). Website: Here. Bird Show Times: Tuesday-Sunday 11am & 3pm; closed Mondays. About Hochosterwitz Castle: Since the timeless Hochosterwitz Castle sits a good distance from any major tourist city, it has remained a hidden gem even though it is one of the best castles to visit in Austria. The Hochosterwitz Castle is one of the oldest we know of as it was already being used in the year 860. Much like the High Werfen Castle, the Hochosterwitz Castle also sis at the very top of a rocky outcrop overlooking the surrounding valley. The high protected position helped shelter locals from Turkish invasions in the 1100s and allowed the Medieval castle to remain one of the most well-preserved in central Europe. In total among the ring walls, there are 14 separate gated from the Middle Ages still standing at the castle. The Hochosterwitz Castle has many activities largely centered around the elements of its history. We love to tour the 500-year-old blacksmith forge which allowed the local royal family of the day to create weapons for their private guards. During the day you even get to see re-enactors portraying the house Honorguard, which started in the year 1600 as hired mercenaries, dressed in traditional yellow and black Renaissance uniforms. 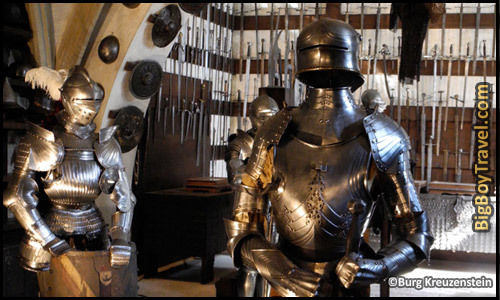 The theme of protection is also covered in the extensive armory at Hochosterwitz Castle which was some of the most intricate Medieval armor we have seen and a collection of weapons going back to the 1300s. The onsite restaurant located inside one of the castle’s Medieval halls is also really cool and lets you experience typical Carinthian food. It is a little bit out of the way to get to Hochosterwitz Castle, but it is well worth the visit if you looking to visit the best castles in Austria. If you’ve seen the hit 1993 movie The Three Musketeers, then you’ve seen the historic Burg Liechtenstein which was featured in the film. Liechtenstein was built way back int 1130 as a tribute to the Prince of Liechtenstein. The Castle remained a Royal seat for over 200 years before switching hands and before switching hands numerous times and being expanded. The Castle is in great shape today, one of the only privately owned castles in Austria, and is a pleasure to visit as a day trip from Vienna. We find Liechtenstein Castle to be very impressive, but not everyone has felt that way. In the 1500s its caretaker George Wiesing hated it so much that he refused to live in it and had a separate palace built to live in below the Castle which can still be seen today. One of the more interesting changes happened in 1683 when Hartmut (the inventor of the modern day pencil) re-fortified the Castle walls after an Ottoman invasion. Getting Here: From Vienna take the Underground Metro to Vienna’s Meidling Train Station on the South side of town and take a local train to Mödling. Trains leave the station about 10 times an hour and the ride is only 15 minutes south of Vienna. At the Mödling Train Station, you take Bus 262 right to the entrance (Siedlungsstraße stop) which is a 6-minute walk to the Castle. Visiting Hours: You can see the outside of the castle and take photos any time of day, but you can only go inside as part of a group tour which has been run since the 1800s. Guided Tour Hours: 50 Minute guided tours at the top of every hour. January & February Saturday at 11am; March-October Daily 10am-4pm (extended to 5pm July & August); November Daily 11am-2pm; December Weekends Noon-2pm. They also take advanced bookings year-round for additional tour times/days. Tour Cost: 9€ for Adults; 6€ for kids; Families 25€. Advanced Booking: To book in advance email them here [email protected] Special Tours: The Castle has a ton of private tour options ranging from 12-20€ and they are really cool. They typically require that you pay for 5+ people but have tours that take you to the top of the tower for wine tastings, cool nights tours, and much more. Facebook Page: (HERE). Castle Website: (HERE). About Burg Mauterndorf: Numerous versions of this mighty castle have been built over the centuries since it was first established by the Romans in 326 AD. During Roman times, the fortress was established to protect the road (Radstädter Tauern Pass) going South from Iuvavum (present-day Salzburg) to the regional capital of Teurnia in the Alps on the way to Italy. The route and fortress stayed one of the most important castles in Austria through Medieval times. The building you get to tour today was built around 1253 (expanded in the 1400s). The most famous guest of the castle was Hermann Göring who was the Nazi general that tried to be Hitler’s successor. Göring’s father was friends the owner and Hermann spent a lot of time here as a child. Later in life, Hermann became a decorated WW1 veteran who served under the famous Red Barron, but then got trie up with Hitler. Göring was shot in the groin during Munich’s failed Beer Hall Putsch in 1923, founded the Gestapo secret police in 1933, and in 1940 ordered the bombing of British civilians in what became known as The Blitz. Although Göring was willed the castle in 1938, he never took formal possession. Hermann was the highest-ranking defendant during the Nuremberg Trials of late-1945 and was sentenced to hang, but killed himself with cyanide before his pending execution. About The Aggstein Castle ruins: The timeless Aggstein Castle ruins are one of the most visited attractions in all of Austria thanks to its stunning views over the Danube River. The castle is most famous for the robber baron Hadmar III von Kuenring that lived here in the early-1100s. Hadmar would stretch a sturdy iron chain across the river to intercept ships going between Regensburg and Vienna. One day the Duke of Austria had a large ship filled on the top with treasures and soldiers underneath sail through as a trap. The loot was some impressive that Hadmar himself came down to size the vessel but was captured. The castle started to become less important after it was badly damaged in 1529 during the first Turkish siege of Vienna. While a lot of the castle is in ruins today they have a well preserved Medieval chapel, a stout wall, and numerous activities going on throughout the year.